If you live in Santa Fe, or if you’re visiting, you have to visit the Santa Fe Farmers Market for fresh summer flowers. Seasonal blooms are on display throughout the market, and many of the local vendors who sell these flowers are happy to help shoppers make the best decision for their flower needs. 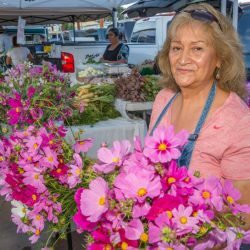 Whether you want blossoms for your home, a luncheon, a wedding dinner, or to give to a friend or family member, you’ll surely find something delightful at the Santa Fe Farmers’ Market. The Santa Fe Farmers’ Market features mountain dessert flowers in all their glory. The unique selection at this farmers market is worth a trip whether you live close by, in nearby Albuquerque, or a bit further out. Because New Mexico receives so many sunshine-y days each year, there are special opportunities for the most gorgeous flowers to grow. Have you shopped for flowers at the Santa Fe Farmers’ market? If so, please tell us in the comments below what you thought about the market and what you bought.